The Public ceremony of Knighthood followed a deeply religious ceremony with blessings from the Church to go forward and protect the church by the use of arms. The entry into Knighthood was highly ritualised which started with a Night Vigil in the Chapel of a Castle or a Church. The Church sanctified wars fought on behalf of the Church which were called Crusades. Every Crusader had to swear "to defend to his uttermost the weak, the orphan, the widow and the oppressed; he should be courteous, and women should receive his especial care". Knighthood was conferred in the adoubement ceremony, or the accolade. The lord presented the sword & shield and 'Dubbed' the squire who was pronounced a Knight when the lord would say, "I dub thee Sir Knight." . At the end of the Knighthood ceremony a Knight could claim the title "Sir". The Knights Shield displayed an heraldic blazon which identified the Knight. The Shield and Spurs were symbols of Knighthood. A disgraced Knight had his spurs hacked off and his shield was hung upside down as a sign of dishonor. 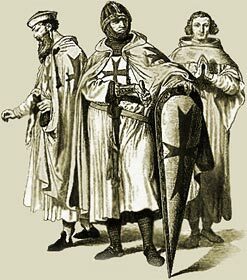 The Medieval Times website provides interesting facts, history and information about knights of old which scatter the Medieval History books including the Knighthood Ceremony. The Medieval Times Sitemap provides full details of all of the information and facts about the fascinating subject of the lives of the people who lived during the historical period of the Middle Ages. The content of this article on Medieval life and times provides free educational details, facts and information for reference and research for schools, colleges and homework for history courses and history coursework.